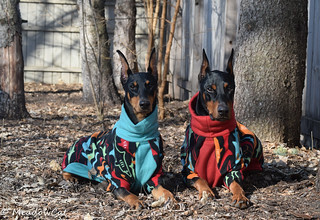 Doberman Forum : Doberman Breed Dog Forums > Doberman Specific Chat > Doberman Health > Strained excessive peeing. UTI? Stump pyometra? Strained excessive peeing. UTI? Stump pyometra? My female was spayed at 6 mos. and is 2 years old. She has had a submissive peeing issue, which complicates matters. She was having vaginal discharge, clear to sometimes green. Suspecting UTI, we have given her cranberry pills, which seemed to help. Over the last 2 months, she has started to try to pee over and over within a few minutes outside. I would try to distract her to stop it since she was straining to the point of blood drops. I took her to the Vet with some captured pee. His thinking was it was stress from my traveling quite a bit and timing seemed to coincide. She really doesn't like it when I leave. He also looked at her pee and said no culture was necessary since he could tell from looking at the specimen. It was almost clear, not cloudy at all. She also is not drinking extra water. Dogs with UTI's usually need/want to drink alot of water. We put her on Composure Pro which did seem to help with the submissive urination, but she is still trying to pee when she has already emptied her bladder. Her spirits are good and willing to play and run at any time. My feeling is this poor girl has something wrong and two Vets have not figured it out. I am really wondering if it is Stump Pyometra. The current Vet said he would need to do surgery to check her out and didn't recommend doing so. In 2 years, she has had her ears done, spay and lost 1/3 of her small intestine from swallowing a corn cob. Corn on the cob is banned in our house! I hate the thought of another surgery unless absolutely necessary. Isn't there a way to scope a female dog? Has anybody experienced this and/or have any recommendations? I'm kind of surprised a vet wouldn't be testing her urine....just "looking" at it wouldn't be enough for me personally. Our former Amy had "open pyometra"...dripping blood / closed Pyo is harder to identify (no external blood). Last edited by Beaumont67; 07-24-2018 at 06:30 PM. New veterinarian! That’s malpractice not to test urine and do bloodwork with those symptoms. New veterinarian NOW!